That is how the CD from Maestro Classics: The Story of Swan Lake begins. This is one in a series of fun, educational CDs for explaining classical music to kids (or parents who don't really know what is going on either). I have always liked classical music. I find it soothing and sort of heart filling-ly emotional at the same time. That said, I am not always in the mood for it. I do not always know who I am listening to or what time period they lived in. So, even though this CD was targeted at kids ages 5 to 12....this "kid" aged 40-something learned quite a bit. We got a chance to listen to and review the Tchaikovksy's Story of Swan Lake, as played by the London Philharmonic Orchestra. The storytelling part was done by someone named Nadu. That is it. Just Nadu. The music was beautiful....some pieces I had heard before.....some were new to me. I liked the sound of Nadu's voice, who explained what was happening in the story, which I have never understood. My kids liked dancing around to it. Even the boys were "persuaded" to perform a few moves mostly to assist the girls. The Maestro Classics website has a lot of educational material available to incorporate with this sort of music appreciation curriculum. If there were 500 people at the ball and 30% of them were single women hoping to be chosen, 40% of them were older noblemen and women, 15% of them were servants, and the rest were young men of the kingdom, how many of each group were there? If each guest had 19 appetizers and at the end of the ball there were 125 left, how many did the chef make overall? If the ball began at 3:30 p.m. and the last guest left at 1:20 a.m. the next morning, how long did the party last? Answers at the bottom of the post....just in case you take this sort of challenge seriously. Yes, I am talking to you, Rainman! It also has the more obvious topics, like ballet, history, medieval times, and castles. Geography....like Russia and its culture. Science - starting with swans and moving onto the Bernoulli Principle (the reason birds can fly - has something to do with air pressure and air movement). We did not delve too deeply into these other areas, but it did give me good ideas for these kinds of curriculum boosters in the future. It was fun. I liked learning all the background information. My girls liked the traditional music that they could dance too. D-man found the Speed Metal Swan funny/entertaining. What is Speed Metal Swan you say? Well....click this....and then choose Speed Metal Swan. I liked learning about Tchaikovsky and learning all of the different music of his I had heard...but didn't know it was his. I liked learning how an insecure, overly sensitive, extremely messy boy became a famous composer! This series is available in either CD form for $16.98 or via MP3 for just $9.98. Go take a look around their site and see if anything catches your ear. You can listen to samples of all of the CDs. This CD was about 60 minutes from start to finish. There is also a little booklet that comes with each CD that gives more information about the composer, the music, music in general, and even some puzzles and fun stuff for the kids to try. We really enjoyed listening to the story of Swan Lake, the music, and learning more about Tchaikovsky himself. Gives me a bit of comfort that he was a messy person. I may just be harboring some sort of musical geniuses at my house! I think if you enjoy classical music already.... just sort of wish you could enjoy it....or even if you want to make your kids be more cultured....this would be a great series of CDs for your family. I am planning to keep this one in our van for road trips. You can see what other TOS reviewers thought of this CD by clicking here. The ball was 9 hours and 50 minutes long. 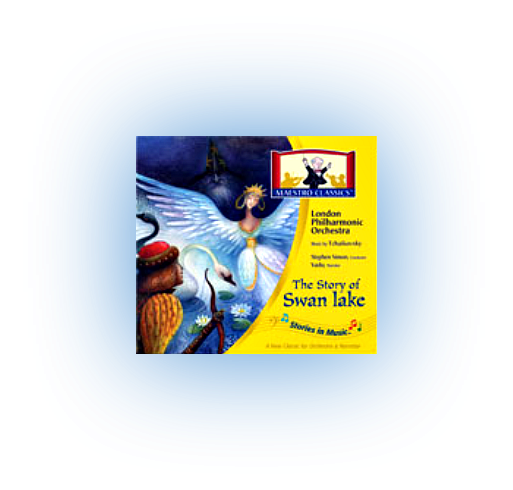 We received a copy of Maestro Classics: The Story of Swan Lake for free in exchange for an honest review of their product.